Halloween is just a few days away, but for several towns in Oklahoma the spooky feeling stays year round. While there are many more, here is a look into some of the ghost towns of Oklahoma. Skedee, Oklahoma: Skedee, originally named Lemert after the family which established the town, was an early prime railroad and agricultural location. In 1909, the settlers established the town with churches, a bank and a public school, with a population of around 277 residents. By the 1950s the town had grown to contain a gasoline station and several agricultural services, but at the end of the decade the town had drastically dwindled. The school was shut down along with many other services. In the beginning of the twenty-first century it was recorded that 102 people still inhabited the town. Today, the school remains untouched. Books, furniture, globes and more still fill the building. Unexplained happenings and sightings have been reported from this abandoned town. 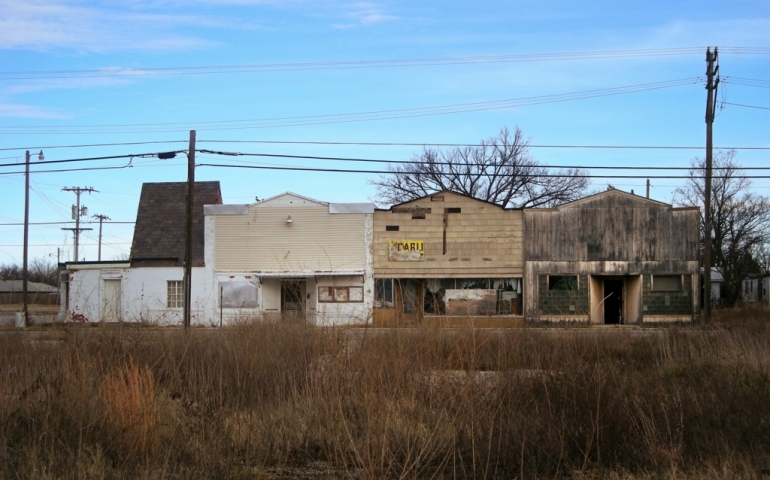 Blackburn, Oklahoma: Blackburn was developed after the Cherokee Outlet in 1893. It was known as a whiskey town before the hit of the prohibition. Blackburn was one of few towns to not be affected by the oil boom, although many of the places around it were highly involved. It also never saw a railroad or state highway, making it difficult to keep the town population up. An old school, gas station and church still stand in Blackburn. The town is looked after by the 25 families that call Blackburn home. Earlsboro, Oklahoma: Earslboro is known to many as the most haunted town in the state of Oklahoma. Formed in 1891, the small town boomed from the sale of liquor. When prohibition hit, the town quickly sank. After its downfall from alcohol sales, Earlsboro boomed once again, this time from oil. The oil boom led to buildings such as a theater, hundred thousand dollar hotel and several businesses. When the oil industry hit a rut, Earlsboro’s population drastically decreased. Today, old buildings still sit on the streets, along with around 640 citizens. The citizens claim that if you can stay in Earlsboro without getting scared out of your mind, then you have not stayed long enough. Slick, Oklahoma: Slick takes us back to the early days in the oil industry. The boom town was founded by Tom B. Slick, otherwise known as Mad Tom Slick, who tried to hide the secret of his discovery of the Cushing Oil Field in 1919. The town exploded once the secret escaped. In just three months the population grew from zero to over 5,000. Businesses were established and the railroad was extended to meet the town. The boom did not last due to the Great Depression, and people cleared out of Slick as fast as they had moved in. A large fire destroyed many of the businesses while others closed due to the Depression. Little remains of the little town today, but several old buildings and homes are still present. Picher, Oklahoma: Picher was a booming city in Northeastern Oklahoma. It was developed around the lead and zinc ore strike. With a peak population in 1926 of 14, 256, the city was the number one spot for mining in Oklahoma. Chat piles from mining were piled sky high, creating a dangerous and contaminated environment for those who lived in the city. Lead poisoning became common which eventually led to the evacuation of the town. In May of 2008, a tornado struck Picher, tearing down many of the old structures that were present. In 2011, the district officially closed the school systems. Between 2011 and 2014 it was planned that all remaining buildings in Picher be demolished. The only remaining citizen died on the ninth of June this year, making Picher an officially abandoned ghost town. Have you ever visited one of these towns? Leave your experiences in the comments below.